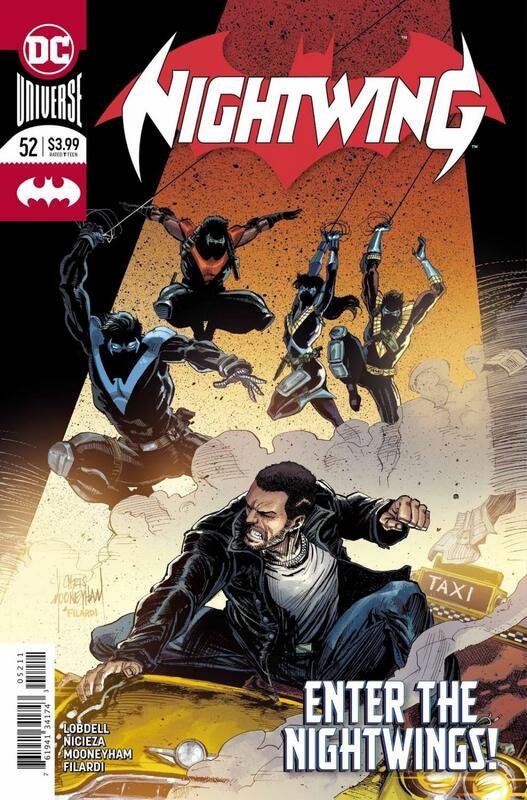 I was really enjoying the story thus far, but this issue really threw a wrench into the gear that is my finally enjoying the Nightwing book. This issue picks up directly after the last issue, with Ric coming to terms with his hidden physical abilities, as well as the police officer who has donned Nightwing's costume. This issue read really quickly, and I feel like the team didn't spend enough time focusing on either of these plot points, so they both came out half-baked and rushed. I wanted more hesitation on both ends; Ric very quickly accepts his abilities and even has fun traversing the environment with his acrobatic skills. Officer Nightwing tries to convince his cop friends to don other costumes he found at Nightwing's lair, and the results seem very rushed. Hesitation is an important thing for me when it comes to character, which seems oddly specific but it works in these kinds of stories. You want things to be drawn out a little bit when our characters are faced with such a predicament. Chris Mooneyham really impressed me when he first jumped onto this series, but his art has devolved for me. It's a lot less solid and more loose and sketchy, which isn't a bad style by any means. It just doesn't compare well to his earlier work. While there was a Romita Jr. influence back then, here it's as similarly half-baked as the plotting. Due to the change in writers, it's perfectly possible that Mooneyham was rushed and he didn't have time to draw this issue as he would have wanted to. Still, I'm judging the art as I see it and it disappointed me. A rushed and relatively worse-looking issue isn't a good sign for me. I hope this series picks back up again, as this story won be over with #50.